Washington is the second largest wine producer in the country, and Woodinville is where it pours. With more than 800 winemakers in the state, more than 100 wineries in Woodinville, and more 90-plus rated vintages than any wine region in the world, Woodinville is where one wines. Woodinville is also home to many craft breweries, which are often crowded with oenophiles washing away their red teeth with hoppy IPAs. In celebration of Peaks and Pints Lodge Meeting with Woodinville brewery 20 Corners Brewing Co. tonight, we present an all-day beer flight of beer straight outta Woodinville that we call Craft Beer Crosscut 3.21.19: A Flight of Woodinville. Bosk Brew Works, a German-influenced, Northwest-inspired operation that largely makes lighter, German-style beers, opened in Woodinville last summer. Head brewer Will Lefevre brews beers on a 30-barrel system, including Goth Beach Party. Picture Robert Smith on the beach. That’s how Lefevre likes to describe this black lager. It’s soft, with moderate sweetness, mild smoke, dark toasted malt, chocolate, coffee and a hint of toffee but finishes clean like a pilsner. In 1995, Mark Ihrig created The Micro Beer Club. Four years later, he launched the Cellars Wine Club in 1999. In 2001, Mark launched Boxing Cat Brewery. 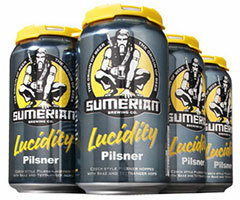 Holly Ihrig, one of the first Microsoft employees, retired in 2012 so the couple could combine their talents to open Sumerian Brewing Co. Their Lucidity Pilsner follows the classic Bohemian Czech style Pilsner brewed with 100 percent German malts and 100 percent European hops for a clean and crisp lager. The aroma is bready, grainy, lemon, and chalky. The taste has some sweet bready malt backed by a faint dry bitterness in the finish. 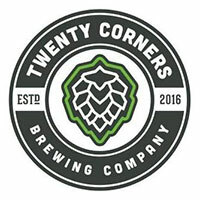 In 2016, Andrew Davis and Vern Olson opened 20 Corners Brewing Co. in the Warehouse District of Woodinville. After they built a brewhouse with 20 corners, they designed the interior and their craft beers around their love for the outdoors. “From fishing, skiing, biking, you name it, our love for the outdoors and creating a brewing process that positively impacts the outdoors is why we do this,” states the 20 Corners Brewing’s website. Ghost Trees Winter White IPA is brewed in the New England style with late hop additions providing abundant aromas of citrus and tropical fruit, all of which is balanced by a soft mouthfeel and a smoothly bitter finish. The 53-year-old The Snorting Elk Cellar at Crystal Mountain repeatedly gets written up as one of the best apres-ski bars in the U.S. Outside and Ski Magazines have both recognized that this place is special. 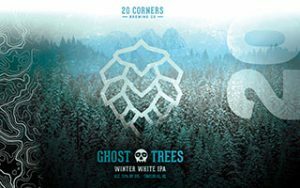 20 Corners Brewing also thinks it’s special. The Woodinville brewery brewed a beer, Elk Haze IPA, specifically for the cozy, low ceiling, fireplace heated, dark, wonderful drinking hole. Almost brewed exclusively with Azacca hops, this hazy IPA isn’t so much tropical as just ripe and tangy, almost like apricot. There’s a bit of grassy and earthy character toward the back, just like the Snorting Elk. If you load up a double IPA with Cascade and Centennial hops, dry hop it twice with Citra and Mosaic, it’s much more than an eruption of hops. What was known as Sumerian Brewing’s Eruption IPA is now Hopruption IPA. Sumerian Brewing changed the name to match the hop explosion, but honestly they could have called it Smoothruption. This crazy hopped double is well balance with a creamy body, lightly sweet and fruit forward.